Historical tourism often feels like a parade of forts and battle sites. A traveller who’s looking for areas of historical interest that are less martial can often be disappointed. Pacifists needn’t despair: There are cities that emphasize their literary heritage over their military history. Readers who couldn’t quite get through Ulysses have other options. Trinity College, alma mater to Wilde and Jonathan Swift, is open to the public, and its Old Library displays one of Ireland’s greatest cultural treasures, The Book of Kells. Handwritten by sixth-century Irish monks in spectacular “insular majuscule" calligraphy, The Book of Kells is a compilation of the four gospels. Dublin’s Writers Museum, across the river from Trinity College, has exhibits which are merely 200 years old and worth a couple of hours. Along with a huge collection of first editions, it houses such oddities as Samuel Beckett’s telephone and Mary Lavins’ teddy bear. Yeats’ letter to Frank O’ Connor, and a (signed) letter from George Bernard Shaw in which he refuses to provide an autograph to a fan, are also on display. Although it’s possible to do this all by yourself, there are other guides, both human and technological, that simplify things for you. If you’ve got a posh phone, download the Dublin Literary Walking Tour (works offline too) iPhone app from Gpsmycity.com, or the GPS City Guide app for the Android or iPhone. Should you prefer a human guide, enrol for the Dublin Literary Pub Crawl (email info@dublinpubcrawl.com). Highly popular, the pub crawl has experienced guides taking you along literary hot spots and providing anecdotes about Irish literature and nationalism. 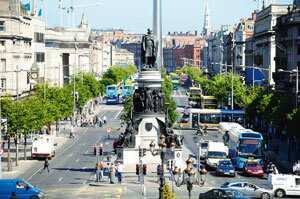 Awarded the City of Literature honour by Unesco last year, Dublin makes sure its visitors know why it was well deserved.